FORGIVEN | FREE is a blog full of stories, sometimes written out but often they will be just images. Because I am saved by HIS grace, I am free to live this beautiful life I have been given, capturing its precious moments as I go, continually forgiven by his abundant love. It's been a week and four days since I left my second home and my mind still struggles for the words to express how I feel. My brain is constantly wondering "why in the world I'm not there" and I often struggle to find the answer. My life at home starts to feel so pointless, like I'm just waiting until I return to Uganda again. This happens almost every trip I take. I return home and my heart feels heavy, I become quick to judge others and snap at those I love the most. I struggle with the idea that we have so much and still are never satisfied. I get angry at the quick paced life we all live and often isolate myself for a bit instead of sharing all I have experienced. Although I miss it, although things are different, although life seems a bit less meaningful, I still carry this sense of peace with me. "My peace I peace with you, My peace I give you." I have been filled with this remarkable peace that only comes from my heavenly father. I have brought home that joy that consumes my soul in Uganda and that is something I have prayed for time and time again. I have not isolated myself but rather poured my heart into those around me who are willing to listen. I am taking all that He has formed me to be and sharing it. Yes, my heart aches when I think of little Patricia and her sassy self, or Benita's sweet hugs and hide and go seek games, but I know I will be back soon. I know the Lord is watching over them. It's been a week and four days since I left my second home and these are the best words I could come up with to express how I feel. It's not much but its all I got. “Nkwagala” Never has such a word ever brought tears to my eyes so quickly. As Baby Martin, spoke these sweet sounds to me, which mean “I love you” in Lugandan, I lost it. Today was tough. Martin and I were filled with nerves as we patiently sat in the Pentagon Hospital waiting room. Just two short days ago I was sitting with him in the clinic as they removed his wounds, when I learned that he was showing signs of Syphilis and HIV. It is apparently very common here for children to get STDs passed down to them from their parents and they suffer greatly from the diseases as they grow and develop. As soon as I found this out, I knew I had to do something. As we waited, I tried my very best to calm his nerves. We bought sodas and took selfies and played games like peek a boo and patty cake but something was still of. He didn’t have the same contagious smile running across his face and his giggles were nowhere to be found. He was just a nervous as I was, I was just trying not to show it. We got called in to see a doctor, who proceeded to do a basic check up and exam on my little one. He then led us to the lab where they would do tests for Malaria, HIV, Typhoid, and Syphilis. As they took his blood and pricked his tiny little finger, Martin squealed and cried. I did my very best to soothe his pains but it was heartbreaking. We waited once again in that very cold and sterile waiting room until the nurse walked out with the results. The doctor took us back once again and explained that Martin tested negative to every single disease and the wounds were just a simple fungal infection. There would be a months worth of tablets and ointment but my little baby boy would be just fine! Praise Jesus!!! I felt like this weight was lifted off my shoulders and I think Martin could feel it too. Our taxi ride back was full of giggles and smiles and “I love you’s” shared back and forth. Once we arrived back at school, Martin didn’t leave my side once. We were best buds now and I was so very happy I could leave knowing he was being taken care of. The rest of the day was a slow one. There was a rainstorm for several hours, leaving us cooped up in the houses. I was a bit exhausted from my morning so I took a nice long nap with baby Patricia. She played with my hair till I fell asleep and poked my nose every 10 minutes to make sure I was still breathing. It was just what I needed after my stressful hospital visit, a day of rest with my youngest little sponsor girl. Tomorrow is full of goodbyes, and my heart hurts when I think about it. It is my last day in Wakiso village before my flight on Friday and my last day seeing all my little bundles of joy. I am not ready to leave this beautiful place at all and words will never capture just how much I am going to miss waking up in my home away from home. Tomorrow is going to be a tough one but I know these goodbyes are just “see you laters” and I am hoping to be back oh so very soon. Today was my first day back at Nations Changers. I was greeted with great big hugs and many little ones yelling “Teacher Gabi!! Teacher Gabi! !,” as I walked through the gates of the school. It was only a week away yet it felt like I was gone for months. I missed these shining faces and adorable little laughs. I missed the way they bring me porridge when it is time for snack and how they laugh when I eat Posho with them for lunch. I missed the silly little games we play on the swing set and the round of hide and seek that usually goes on for hours. Today was my first day back at Nations Changers and boy was it good to be home. I spent most of today in the clinic. I found out today that one of my little ones, Martin, is sick and I sat with him for hours as the nurse removed the wounds from his precious little head. He squeezed my hand so tight and tried so very hard not to cry, but eventually both of us had steams of tears rushing down our face. Its so very hard to watch him in pain, it breaks my heart. I am torn in two over what to do to treat this little one but all I know is that I will be by his side no matter what. I also spent time with my baby Patricia, taking selfies and playing with her new stuffed animal dog. She told me she missed me in Lugandan and those sweet words never meant so much. We spent a good hour playing peek-a-boo, which usually only lasts 2 minutes but for some reason today Patricia found it so so funny. I could listen to her laugh for hours. Today was my first day back at Nations Changers and it was full of ups and downs, of tears and smiles, of laughter and pain but it is so good to be back. These next four days will never be enough. This past week was too good for words. The new CHF team made me feel like I was apart of the family and I cannot thank them enough for reminding me just how much I love the village of Guru Guru. Nothing can compare to Northern Ugandan in my mind. The air is different, the scenery is different, and the people are different as well. I got the chance to see many of the little ones who stole my heart last year and the year before that, and boy did they grow up! My little girl Ruth is now in K3 and she will be starting Primary 1 this next year. She pretends to be shy for the first five minutes every day but then lets that go and is her silly social self again. Baby Mwaka is in K1 and could not be more of a cuddle bug. His smile is absolutely contagious and I could listen to him giggle for hours. Olivia is now in Primary 3 and she blew me away with her English. She formed a little group of “best friends” including me, Sophie, Beatrice, herself, and of course we went everywhere together. It was so incredibly refreshing to spend the week somewhere new, with new people, new stories, and many new experiences. As I say goodbye to Gulu today and I head back home to Mukono, I am overwhelmed by the emotions that this internship is quickly coming to an end. I have five more days in this beautiful country and I am not at all prepared for these goodbyes. As tears fill my eyes at the thought of all this, I realize how very blessed I am to live this crazy life that I live, How blessed I am to have something that makes saying goodbye so hard. Who else can say they have so many beautiful people on two opposite sides of the world that they love so dearly. I never once would have imagined that I would fall in love with this country, much less visit six times in four years, but thank goodness I did. I have learned stillness and I have learned love. The people of Uganda have shown me what it looks like to live for the Lord and how to find freedom in being a child of God. I have experienced true joy in this country and I thank Jesus for that each and every day. I wrote this in my journal today and felt like it sums up how my heart is feeling. I am not the best at writing my prayers but I thought I’d share this one. "Be still and know." These past nine days taught me what those four words truly mean. I had heard this Psalm many times before, prayed over it, and even had it written up on my wall in my dorm, but until the past nine days I never truly grasped what stillness in the Lord could mean. The Ugandan culture is much different than ours. The hustle and bustle of everyday life is a bit slower and timing has a whole new meaning. Meeting at 9am may mean that you won’t meet till 11am; a 15-minute task may take 2 hours. The quick paced and rushed way of life is just not the way things go around here. I first struggled with this immensely, growing impatient and lonely as I waited or hurried to get my tasks done. But as the days went on and I began to adapt to the culture of this country that I know and love, I saw the beauty in taking time to slow down. Taking time to notice the details around me. My life at home is often so rushed, so busy, so hectic, leaving little room for life to simply happen in between. But the thing I have treasured most about these past 9 days is the unexpected joy that those moments of “in between” often bring. Take time to be still. Take time to acknowledge your heavenly father. Take time to know that He is holding you in His arms every single step of the way. Take time to see how much joy this life can truly bring. Take time to be still. One of most favorite days this past week was Saturday. I took two of my three sponsor girls out to Jinja for the day. We talked, shopped, and ate till our tummies just about exploded. We sang songs, we pointed at monkeys on our drive, and we ended our day with a nice long nap on the car ride home. This day was just pure joy. They were both dressed up in their new dresses I brought them from home and added lovely new necklaces, bracelets, and leather sandals to their wardrobes. My heart was so full of gratitude and thankfulness because I finally felt like they grasped how much they meant to me. They realized that they were mine and I was theirs and they could always always always know that to be true. My other most favorite day was Tuesday. Nerves were high and anxiety was kicking in but I was going to do it. I was going to spend the night in the village. I am not someone who is great at sleeping away from my own bed in general so this was a real big step for me. No electricity, no toilet, no running water, but I knew in my heart that I wanted to do this. I was going to sleep in a tiny little bunk bed with my baby Patricia, who I have mentioned before. To explain this bunk bed a bit better, it was the bottom bunk, about 4 and a half feel long, and had a thick pad on it as a mattress and a thin old sheet on top. The blanket was about as soft as sand paper and the mosquito net had as many holes as there were kids in this room, that being 17. Lets just say I was anxious. And then there were three of us. I slept in constant cuddles from my two most favorite little girls on this planet and as they slept, I had one of those moments that I always picked on my mom for. Tears came rushing down my face and I heard my mom’s voice saying. “They’re happy tears gabs…one day you’ll understand” and boy oh boy did I understand. Exhausted might be an understatement. Running on little to no sleep and a whole lot of tears, I have never thought being this exhausted could be worth it. After bittersweet goodbyes with the SFC team yesterday, I finally felt ready to tackle these nine days alone, with just my local Ugandan friends and I. That was until I made a not so smart decision to roll my window down during rush hour Kampala traffic, of course ending in a snatched phone and a pretty stressed out Gabi. Taking many deep breaths and saying many little prayers, I began to repeat in my mind “its just a phone, its just a phone, it is just a phone” and suddenly I realized that it really was just a silly little phone. If you know me at all, you know that I am sadly a bit obsessed with that black shinny thing I always carry in my hands so I came to this epiphany that maybe this was God’s way of testing me, or really just proving to me, that I will be just fine without this thing I consider my “lifeline” and that any replacement I find will be just fine. So long story short, I barely slept, drove back into Kampala this morning, bought a slightly worn iPhone 4, and headed back on my way to Mukono, And you know what, God was right… I am doing just fine. My apologies for not writing one bit during this past week with the Santa Fe Team, I knew this blogging thing would take a little time to get used to. To fill you all in, I had a total blast. After a couple days of work, crafts, games, and just spending time with the kids, this SFC team quickly became one of my favorites. They were something special and I fell in love with the way they loved these kids. They all threw themselves wholeheartedly into each child, they made sure that they knew they were loved, and took special time to remind them that they had so much to offer this world around them. After the announcement of their surprise Safari on Saturday night, the excitement was at an all time high. Yet sadly, that’s when things started to decline. After one sick kid got the stomach bug, it wasn’t long before the next one had it too, and then the next. Thank goodness it only got to three but those poor three got it bad. I spent most of my safari game drive Monday morning sleeping off some weird stomach bug myself, which thankfully only lasted 12 hours unlike the 3 days it stuck with the others. The 9-hour drive home consisted of me changing out cool rags for one feverish student and constantly praying to keep food down myself. And the day after that was my day to play “mom” and stay with the sickies once again. It was a whole lot to handle but thank goodness everyone is home and healthy now. Let’s just say I am ready for some kiddo time! I can’t wait to snuggle my baby Patricia and laugh at her funny dance moves. I can’t wait to listen to Frank mumble on in Lugandan expecting me to understand his every demand. I can’t wait to be attacked with a great big hug from Peace, followed soon after by a baby hug from her little brother Martin. I can’t wait to spend all day tomorrow capturing update sponsorship photos of those adorable 40 kids who I LOVE watching grow. I can’t wait!!! Although they started off to a rocky start, I think these next 9 days are going to be just what I need. Six days in and my heart is so full. Stepping back on to the Nations Changers campus yesterday in awe, I could not believe all that the Lord has made happen in just a year. The first time I ever visited Wakiso, five years ago, this property was just overgrown bush, and now it is an irremarkable example of just how stinking amazing Jesus is. This land went from one children’s home, to the next, and to the next. Then came a school, and then a playground, and then a nursery building, and it just continues to grow. Nations Changers now has 400 students, who - by the way – are probably my favorite 400 kids in the entire world, and is growing and developing every single day. I also have been smothered in cuddles by my three sponsor girls non-stop and I am not complaining one bit. Baby Patricia is finally old enough for Baby Class, Uganda’s version of the first year of pre-school, and she is just about as spunky as ever. Nakalyango, or as some call her, Jane, has promoted to Top Class, or Kindergarten, and never fails to wear a smile as bright as the sun. Benita, my oldest, is now in primary 2 and can finally speak English well enough to have the BEST conversations with me. These three are almost always by my side or in my arms and they make me the proudest sponsor, or “mizungu” mommy, out there. I have also been so blessed by the sixteen Santa Fe Christian kids here with me, helping me regain a bit of that “first time in Uganda” excitement and awe. There is something about your first trip, something so special and almost indescribable, and having these students here with me has brought me a bit of that feeling back. Watching them interact for the first time with the kids that have completely stolen my heart and see them fall in love with them just the same, has brought my oh so much joy and its only been two days. As I was reading last night, a book my mom bought me a while back, I realized for the first time what made me fall so in love with Uganda. The book is called “You are Free,” written by Rebekah Lyons and as the title suggests, speaks about the immediate freedom that comes with a relationship with the Lord. At the end of chapter 1, it asks you to recall a time when you felt truly and completely free… of course I wrote my first time in Uganda. But then it hit me. I always described the joy that came from my trips, as a feeling of being “enough.” It was the only way I could describe it, it was this feeling or rather a lack of the feeling that you must always have something to offer. But as I sat there and thought about this feeling of freedom, I realized that my experiences here were less about feeling “enough” and more about feeling free. I have come to terms, especially in the last year, that I am not and never will be “enough.” I am broken and I am incomplete. I live in an imperfect world, and I will never be “enough” for those around me, not friends, not a boy, not anyone. And after months of struggling, I finally have realized that, that is okay. I no longer need to feel “enough.” Because God doesn’t need me to be. He uses me exactly the way that I am. 37 hours of travel later, I am here!!!! Nothing is sweeter than hearing my Ugandan friends greet me with "welcome home gabi" as I step out of the Entebbe airport. My heart automatically feels so at peace and I am reminded why I have fallen in love with this country oh so many times. As I patiently await the arrival of the Santa Fe team, I fill my journals with pages of thoughts and prayers for these next few weeks. I remember my very first time stepping foot in this beautiful country, blown away by its beauty, and I cannot contain my excitement for this team to experience that. We have so much in store over these next 10 days in Wakiso Village, from painting nursery buildings to teaching in the classrooms, and I cannot wait to see how God uses us! If you know me, you know I am someone who overthinks. I overthink about overthinking... and then I overthink about that. This past year has been nothing but unexpected turns and shifts and nothing went the way I planned. I felt lost time and time again and found myself constantly overthinking. I was focusing on my past, my past decisions, my past mistakes, and all the "what ifs" I could possibly think of. As I sat in that little airplane seat, reading my dad's letter, this verse just stuck. "I am not all I should be" and boy is that true! But from now on "I am focusing on this one thing, not the million of thoughts that constantly run through my mind. I am focusing on "forgetting the past and focusing on what lies ahead." So here's to the next six weeks, to focusing on the present, to accepting the past, and to living knowing God is holding me in his hands every single step of the way. Forgiven + Free is mostly used to share my recent shoots, to tell stories, and post snippets of things that I love. But for the next 5 weeks, I will be living in my home away from home, Uganda, and will be using this blog to share this incredible experience with all of you. As most of you have read, I have been to Uganda five previous times, however the longest trip I've ever taken was about 10 days. This time it's a bit different. I am so in awe of God's power and strength to bring me back to this incredibly beautiful place once again and cannot wait to see how he works in and through me during this time. I apologize now for grammar and spelling mishaps and for posting at odd times due to my lack of wifi but I promise promise promise to do my best to keep things updated. I want to say a HUGE thank you to everyone that has supported me again and again. My heart beats for this country and I am so excited to be able to share my stores and photos with all of you. Please keep me in your prayers as I leave this Wednesday to fly back to my second home. "I NEED HELP. PLEASE SPONSOR ME." These crushing words on a crumpled up lined paper hurt my heart as soon as I read them. I looked down at precious little brown eyes just longing for someone to care for her, someone to love her and someone to support her. As she handed me this note, my heart shattered. Surrounded by the beautiful Ugandan sunset, all I could think about was any possible way I could sponsor this child. Ideas were rushing through my head, but sadly the conclusion was that there was no possible way. This little girl didn't attend a school to which I was connected, she appeared to have no family members or guardians that could assist in setting up a way to supply her with funds, nor did she even have a set address that would allow me to ship her basic necessities. Yet in that moment all, I wanted to do was say yes. I wanted to be that one person that she knew she could trust and rely on, but I couldn't. I could barely form the words to explain to her how sorry I was. With tears running down both of our faces, I had to get back into our van. As I looked out the window, barely able to breathe, a shattering sense of failure and disappointment in myself began to overwhelm me. 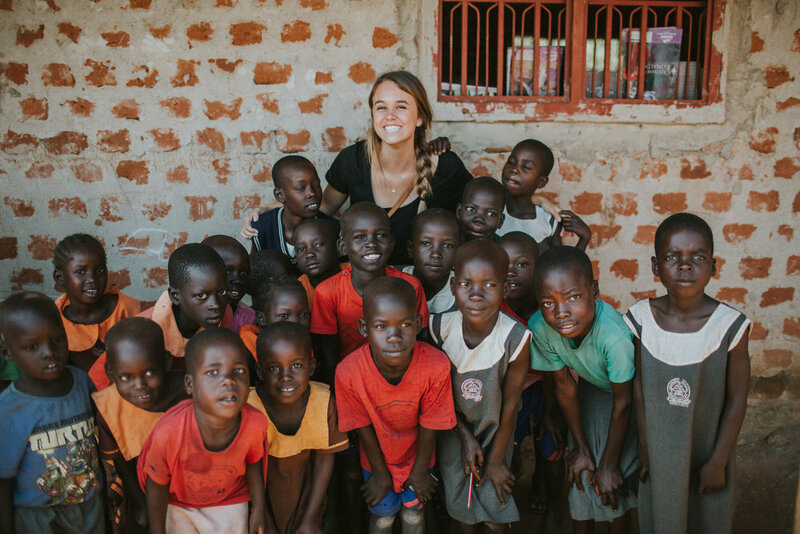 While this was only my 2nd trip to Uganda, it already felt like a second home to me. The pain of this experience ran deep. I could have just handed over the few shillings I had in my bag but her request was much more than that to me. To sponsor a child meant to be someone they could count on, someone that they knew believed in investing in their future. After being left broken hearted time and time again, this 10 year old was still full of hope and was asking me not just for money, but to be the one person she could count on. In my eyes, I had failed. As we drove away in our van, she chased after us with her eyes full of tears, yelling, "Please just help me." I sobbed. I never thought I would get rid of this aching feeling of failure that tugged at my heart. As months passed on, I continued to think about that moment, wondering if the pain would ever subside. It wasn't until I returned to Uganda on another trip, where the wisdom of our trip leader, local pastor, and dear friends, helped me to finally overcome the deep feeling of failure. I learned to look at the situation with a new lens. 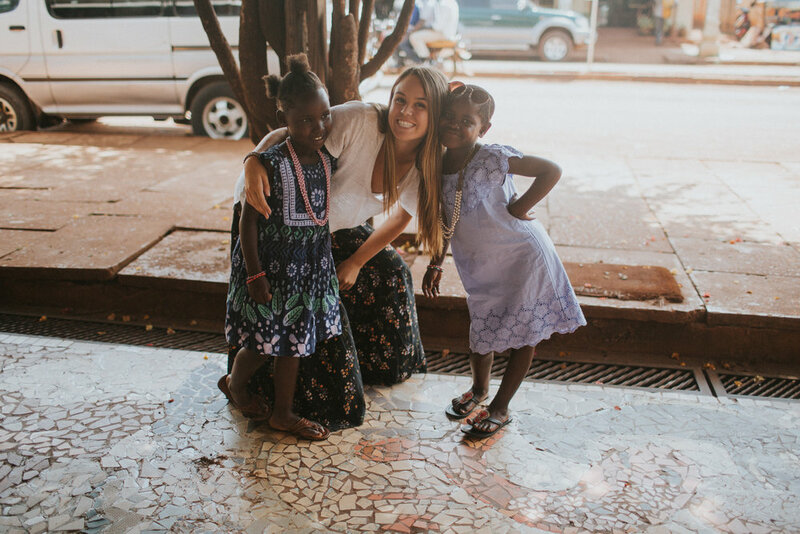 I learned that while I can't sponsor every kid, fund every child's schooling, or even make sure they always have a pair of shoes, I can spend the time to get to know them. I can listen when they have no one to talk to and kiss their wounded knees when they trip and fall. I have learned a relationship with someone will always mean more than a monthly check. It took me a while to see that all these children really wanted to know was that I loved them. This moment of failure, or so I thought at the time, will forever shape the way I view relationships. Those around us just want to feel loved and supported. As I continue on, hoping one day to spend many years in my second home, Uganda, I will view the trials I face in a way that always puts loving others first. I hope one day to hug that little girl again, to tell her I believe in her, and to see her huge smile shine across her face. I can't wait for that day. There's something about the faith of a child, to be completely in awe of what Christ has done for us and so full of joy that you can't help but explode with love. These little ones have shown me just that. Each and every time I see their shining faces, I see Christ in them. He's the youngest in his family. He lives in a village called Guru Guru, just a ways outside of Gulu. He must not be much older than two but he's got the sassiest, spunkiest, and loveliest personality. I miss him dearly each day. The way he taught me its okay to fall down, sometimes its even fun because then you get back up. The way taught me to take time to notice the details in everyday, to stop and stare at the goats, or the bodas, or even other silly kiddos. I miss his little cuddles and how he loved to tickle my cheeks and squeal when I laughed. I miss playing peek a boo, trying our best to mend the language barrier that stood between us. The way he help my hand so tightly when we prayed in church, the way he worshiped his heavenly father with a devotion most adults struggle to find. He understands he has a Savior that loves him, that cares for him, and most of all believes in him. This little one has a big future... I just know it. I met sweet Benita four years ago on my first trip to Uganda. She had never seen a "mizungu" before and was a bit hesitant to open up to me. We sat on a bench a couple feet apart and shared looks back in forth, after a while those looks turned into smiles, and suddenly she was non-stop giggles sitting on my lap. Her favorite was copying my poses when I would take her photo and pointing at the screen laughing when I would show her them. My second trip back, two years later, I went to her village and saw her sweet little face. I ran over and she automatically stroke a pose and begged me to take a picture (as featured in one of the photos on the left). She was still that sassy and silly little gal but she had also been through a whole lot that I did not know about. Benita's parents are not a part of her life. In fact, she doesn't even know if they are alive. She lives with her grandmother whenever she is not boarding at Nations Changers Christian School, a primary school that I have been blessed to watch form and come into fruition. I have the beautiful blessing of sponsoring her. I have seen her on every trip I have taken to this beautiful village of Wakiso, bringing her lovely new dresses and coloring books galore. I smother her in kisses and make sure she knows how loved she is. As I watch her grow up into this beautiful soul, I wish she knew how much she has blessed me. I hope one day to share with her the lessons she's unknowingly taught me, the tough times she's pulled me through, and the pain that her little smile has mended.